SOLANA BEACH — Angel Nava, 63, has the 100 civics questions on the U.S. citizenship test down pat. Every Wednesday night, the 45-year Encinitas resident attends a citizenship tutoring event hosted by the North County Immigration and Citizenship Center (NCICC), a nonprofit that focuses on helping local immigrants obtain citizenship. Nava, who studies the cards assiduously both at home and during the events, started attending the classes five months ago. His primary reason? To be able to vote. And Nava is not alone — he is just one of many students served by the nonprofit, which was founded in 2012 by a group of local churchgoers at the Solana Beach Presbyterian Church. Stephen Carlton — a former educator and one of five founding board members — first recognized a need for immigrant educational services in 2008, when he was working as a tutor at Casa de Amistad, a learning center in Solana Beach. He remembers seeing groups of parents milling around outside, conversing in Spanish and waiting for their children. “I began to really be burdened by the fact that we were working with the students, but who is addressing the needs of the adults, the parents?” Carlton said. Carlton and several others jumpstarted what was termed the Adult Literacy Academy. 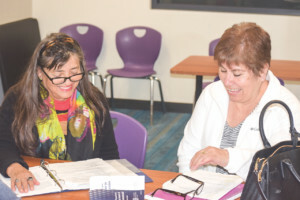 Fulfilling the need for adult education among immigrants in the community — particularly those living in the Hispanic pockets of North County such as La Colonia de Eden Park — spurred a realization that the community’s needs went far beyond language learning. Its initial mission to educate soon materialized into a widely inclusive objective: to serve the immigrant community in North County. The organization has upheld its original educational pursuits: offering English as a Second Language (ESL) courses, driving lessons for non-English speakers, and citizenship classes at the Solana Beach Public Library. 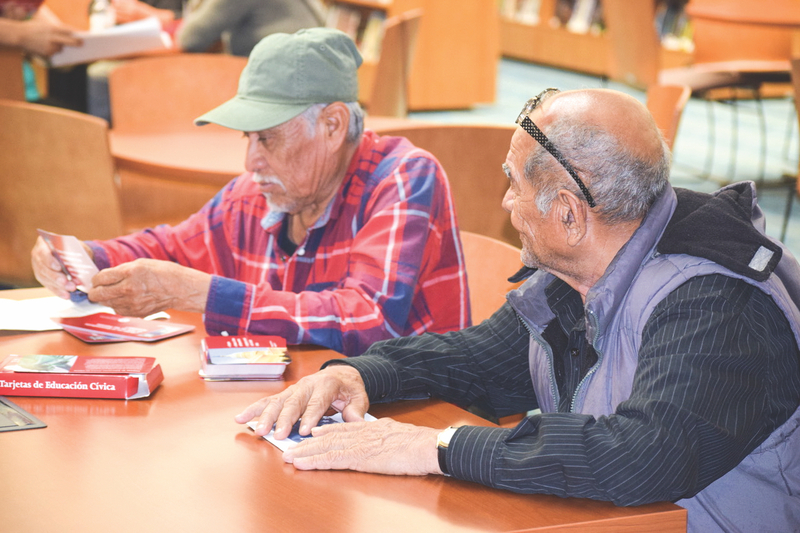 At a citizenship class in mid-November, over a dozen permanent residents gathered at the library to study, answering citizenship test questions printed on large, red flash cards — often in Spanish. Questions range from the simple (“What is the name of the President of United States now?”) to the head-scratching (“What is the ‘rule of law’?”). Several students have their exams and interviews in just a few weeks. And although Nava knows most of the answers by heart, many are just beginning the process. Newly minted citizen and now-volunteer Eulogio Saldivar flips through the flash cards with students Cruz Saldivar and Figueroa Isidro Rivas. “Some are easy, some are hard,” said Cruz Saldivar, a 27-year Solana Beach resident who has been attending the event for about a month. The attendees typically work one-on-one with a tutor to go through the questions, while some participate in mock naturalization interviews or go through their naturalization applications with a staff member. NCICC Volunteer Effie Lewis (left), who herself became a U.S. Citizen in 1995, takes student and longtime Solana Beach resident Sara Ramos through the list of questions on the U.S. citizenship test. Photo by Lexy Brodt. In addition to its educational arm, the center now offers various legal services at a low-cost rate, meant to encourage permanent residents to take the final leap to pursue citizenship. Its legal arm didn’t take off until 2016, according to Executive Director Linda Martinez Haley. The Department of Justice-accredited organization has five staff that can help screen clients and assist them in the process of submitting their N-400’s, the naturalization application. Depending on a number of criteria, clients might wait about a year for their application to be processed, at which point they take the citizenship test and interview with U.S. Citizenship and Immigration Services. The North County Immigration and Citizenship Center has assisted 43 residents in attaining citizenship since 2016. And the demand is growing — 20 of those citizens took their oath in the last nine months. So far, the center has a 100 percent pass rate. Although clients are primarily from Latino backgrounds, the center has faced a far-reaching demand — with clients from 22 countries including France, Sudan and Cambodia. “Meeting a need for the safety and security of those at risk in our community, and keeping those families together, is what we do, where our success has been, and where we’re learning we can make an impact,” Enns said. But not all paths to citizenship are created equal. The center sometimes receives more complicated cases — in which they might have to expunge a DUI from a client’s record, for example. Even when they are approached by clients who are ineligible for citizenship, they try their best to point out any available resources, or encourage them to participate in the ESL course. “We don’t turn people away,” Carlton said. In order to broaden the legal services they can provide, the center has partnered with several attorneys on a pro bono basis, including seven attorneys with Fragomen LLP — a San Diego-based law firm that specializes in providing immigration-related services. The attorneys often attend the citizenship tutoring events on Wednesdays to meet with students and help them prepare for their interviews. They also help the center’s staff with more difficult cases, and lend their expertise to the center’s Tuesday office hours to answer general questions from clients. The only entity of its kind in North County, the center is also reaching out to other churches and organizations in the region, taking “promising practices” and training individuals at other locations to provide similar services. The nonprofit — which Stephen jokingly referred to as a “boutique immigration service” — runs on a roughly $70,000 annual budget. Its staff members work on a part-time basis, and the organization relies on the services of over a hundred volunteers — ranging in age from 12 to 82. A large portion of its funding comes from a competitive three-year grant from the Presbytery of San Diego, with additional funds from the city of Solana Beach, the Solana Fund and Kingdom Builders grants. The rest is raised through various fundraising efforts. As national immigration policy has seen swooping changes over the years, the center has evolved accordingly. When the Deferred Action for Childhood Arrivals (DACA) was instated in 2012, board members were galvanized to provide legal services for young immigrants. With a reversal of the policy under the current administration, the center now only offers DACA renewal services — cases that arise about once a month. As their focus has zoomed in on the naturalization process, board members have seen the average age of their client base shift back to an older population. Although board members call their mission spiritual rather than political, Carlton thinks the current state of politics may play a role in the center’s demand. “If anything the current climate has really been encouraging immigrants who have their green cards and are eligible for naturalization to push ahead and become citizens so they can participate in our democracy,” he said.